Aristotle is an angry teen with a brother in prison. Dante is a know-it-all who has an unusual way of looking at the world. When the two meet at the swimming pool, they seem to have nothing in common. But as the loners start spending time together, they discover that they share a special friendship, the kind that changes lives and lasts a lifetime. And it is through this friendship that Ari and Dante will learn the most important truths about themselves and the kind of people they want to be. 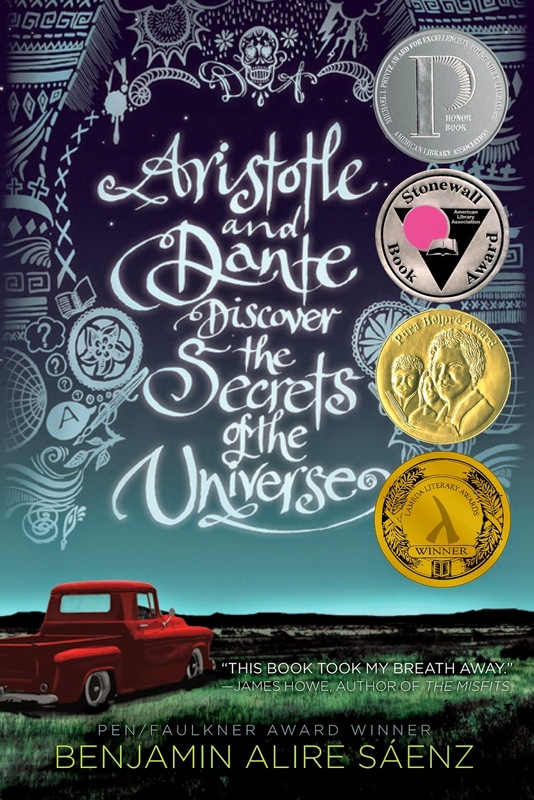 Aristotle has never had any friends, the Mexican American introverted fifteen year old, allows his anger to brood quietly under the surface and Ari has a lot to be angry about. His father barely speaks, reliving the horrors of war through his own thoughts. His mother is strict but loves her son fiercely, and his twin sisters instilled in Ari that he was born too late. But too late for what? The elephant in the room has always been his older brother. Ari needs to know who his brother is, but Bernardo is in prison. Something the family refuses to talk about. But it isn't until Ari meets the dramatic and gentle Dante at the local pool, when he finds a kindred spirit... Even if he doesn't recognise him as one. Dante marches to the beat of his own drum. He hates shoes, loves to swim and feels the need to rescue birds who have been injured. He has a kind heart, but has never had a friend who understands his need to philosophise life and discover the secrets of the universe. The two boys form a strong bond and soon become inseparable. But when Dante finds his life is in danger, Ari puts his own on the line. Each boy having found a best friend in the other. But as Dante is beginning to discover who he truly is, Ari has never felt more lost. His anger and frustration are simmering, as Dante's family move to the city. The boys continue to stay in touch, with Dante writing Ari letters on life, love and the beauty he finds each day. But Ari is busy discovering his own secrets of the universe, and although missing his friend, he needs to learn how to live. When the two boys are reunited, they both release neither can live without the other in their life. Absolutely magical. Never have I read a contemporary so utterly brilliant. It's not only beautifully written, but has a simplistic but poetic prose that readers will fall madly in love with. Both Dante and Aristotle are unique characters, so different but compliment one another as they both learn to grow and discover who they truly are. Both boys are Mexican decent, with Ari being proud of his roots, but Dante with his English professor father feels he's never truly fitted in. But Dante is incredible, I fell madly in love with his character, what he stood for and his gentle soul that goes about making the world a better place. He's incredibly emotional, intelligent and has a brilliant sense of adventure. Ari is a sad and angry young man. He yearns for his father just to talk to him, to share the nightmares both father and son share, but both for very different reasons. His mother is loving and affectionate, but is reluctant to let Ari experience life and holds a secret that is slowly destroying him. Ari is the more surprising of the two boys, although his inner thoughts are transparent, the reader will be taken on his journey of self discovery. The storyline is incredible, it's more than a coming of age novel. It's about learning to accept who you are, why you're important and that in the grand scheme of life, that you need to live it. Oh, you have to get it. It's one of the most brilliant, if not THE most brilliant, coming of age novels I've read. You're already like Elf, even without the book. I really enjoyed this book... I didn't love it though. For me I wish there would've been more plot to it. But I loved people just living life and learning who they are. I actually didn't notice the lack of plotline, I found it that engaging. I think there was a subtle one there, more about the journey, not the destination type. Thanks for stopping by Angela. It's so SO worth it Chiara, gosh it was just one of those books that simply has to be experienced. It was emotional, depressing, witty, intelligent and joyful. I fell completely and utterly in love. Nearly every time I see you review a book it creeps up my to read list then the more and more I think about the more compelled I feel to read it. READ IT. READ IT. READ IT. READ IT. READ IT. READ IT. READ IT. READ IT. READ IT. READ IT. READ IT. READ IT. READ IT. READ IT. READ IT. READ IT. READ IT. READ IT. READ IT. READ IT. READ IT. READ IT. I already want to reread it again. Can't wait to see what you think of it Katie. He may have the cooler name, but I guarantee that you'll fall in love with Dante more so. He's one of the quirkiest characters I've had the pleasure of reading. I hope you love this one as much as I did. Me too Laura. People NEED to be reading this one. It's incredible. It's one I'll read again and again. I seen someone mention on Twitter that there may be a second book in the works from Dante's point of view. Fingers crossed. The cover is lovely close up though, seeing it online doesn't really do it justice. But it's a a truly gorgeous book Rochelle, I think you'll really enjoy it. This sounds so amazing! As soon as I finished reading your post I went on to my library's online catalogue to look for it and THEY DIDN'T HAVE IT! Then I checked their ebook selection and guess what THEY DIDN'T HAVE IT!! Then I went and checked all the libraries in my state and THEY DIDN'T HAVE IT!!! Oh the torturous torture. I guess it's because it was only published very recently but still...I'm sure I've seen this around on YouTube/BookTube before. And I take back my last comment. Just. Found. A. Copy. Hooray! So glad you found a copy to enjoy. Can't wait to see what you think of it. Thanks for commenting. It's truly magical Faye. It's only the second MM young adult I've come across, but really looking forward to checking out more. They seem to have a certain depth and gentleness that male / female YA characters lack in so many books. Can't wait to see what you think of it. YAY, so glad you liked this. Remember how you recommended it when I asked for a book with non-white MCs? Well, I requested it and I got approved, so it should arrive soon. I can't wait to read it!! :D great review, it's so easy to see how much you like it. Awesome, Kelly. It sounds like I was right in adding it to my wishlist. I can't remember if it's out yet, but I might go for a walk over to Big W across the road from me and see if I can find a copy today. That counts as daily exercise, right? Of course it does Brett. Even shopping online requires having to actively click your mouse, that's also exercise too. I think you'll love this one, so many of your books are those deep, thought provoking reads. If you're looking for an intelligent and emotional read, you'll love it. OMG I can't believe I haven't been convinced to read this before but you and Joyous Reads have said similar things about how awesome it is. Beautiful review Kelly, I'm going to have to track this down. This sounds so, so good, Kel, so good that I'm wondering why I didn't read it years ago! I added it to my tbr recently because I needed to read a book with a Latino main character, and now I'm really looking forward to it! I've seen this book making the rounds. Now look at all of those awards. This book isn't going anywhere anytime soon. I'll add it to the TBR. That's interesting. Most people I've talked to really enjoyed this book, but I was bored a lot. I guess I just couldn't connect to the boys. I still gave it 3 stars though, but I wouldn't call it an amazing book. But I'm glad to see so many people enjoying it. Can't please us all lol. This book sounds interesting, catchy title too! I love reading a review when the blog is over the top excited for a book - this doesn't happen often (nor should it, right?). I'm adding this to my list. thanks!